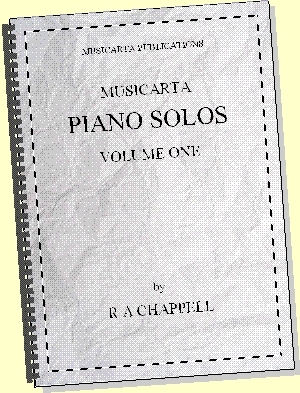 Songwriting Techniques – Adding a Chord-tone Melody is a try-before-buy content sample page for the Musicarta Pyramids Variations. 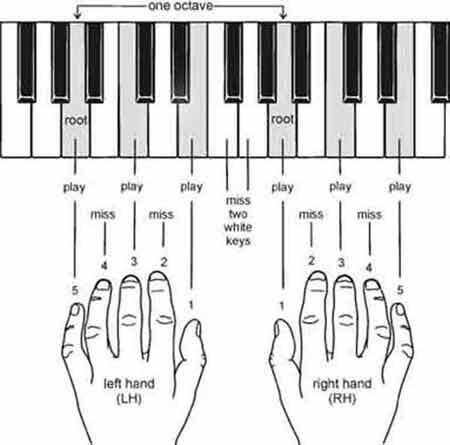 This page now takes a more general look at Musicarta’s songwriting techniques for keyboard players. Here’s a brief summary of the situation. Most pieces of modern (popular) music have a fairly simple sequence of chords played on guitars and/or keyboard, with a bass guitar bass line, for all to hear. But chords on their own aren’t enough to make a song or a piece of music. We expect to hear a tune as well, on top of the supporting chords. 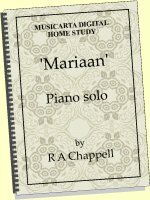 The main ‘anchor’ notes of this melody are usually notes of the supporting chord - ;chord tones. 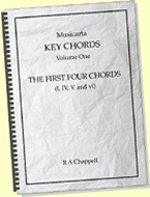 The melody wanders between chord tones, using next-door notes most of the time, arriving at a chord tone of any new chord in an attractive, interesting way. It really is that simple! But knowing it and doing it are two different things – especially for keyboard players, who are often expected to do everything themselves! That’s where the Musicarta Pyramids Variations comes in. The Pyramids Variations is a practical course of lessons which brings essential aspects of music theory to life and leaves you able (in this example) to play a chord sequence from a chord chart, add a chord-tone melody on top and join the melody notes up in interesting ways. All the notes from the previous version are still there. There is only one new note in each bar. It’s the highest note and it’s on the first beat so it stands out, as a melody should. Here's what your download MIDI file of this example looks like when younplay on the MidiPiano virtual keyboard (Windows OS, included). The Pyramids Variations teaches lots more aspects of ‘practical music theory’ that will give your songwriting and composing a boost. Here one example. This gives you the simplest possible chord, with the chord’s name-note – the root, the letter in the chord symbol – at the bottom. 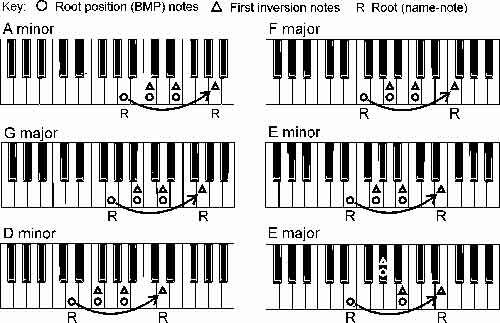 But we also want to be able to use either of the other chord tones at the top of the chord as a melody note – we need to be able to make inversions. Play the three-note chord indicated by the circles (root position), then take the bottom note ‘up an octave’ to make the first inversion chord (indicated by the triangles). You have made first inversions of the six chords in the simple Pyramids version. Here’s a version of the Pyramids chord sequence from the Variations sections which uses both BMP and first inversion chords. Notice that the chords are played top-to-bottom instead of bottom-to-top – the Pyramids Variations has many similar techniques for getting more out of what you know! 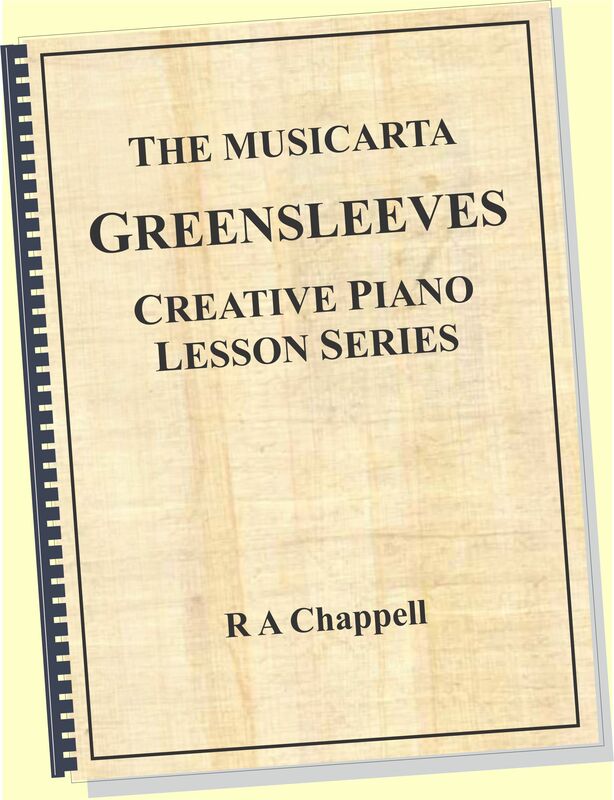 Continue your exploration of the Musicarta Pyramids Variations digital home study pack using the links in the series navigation table (right-hand column), or click up to the series home page for an overview. 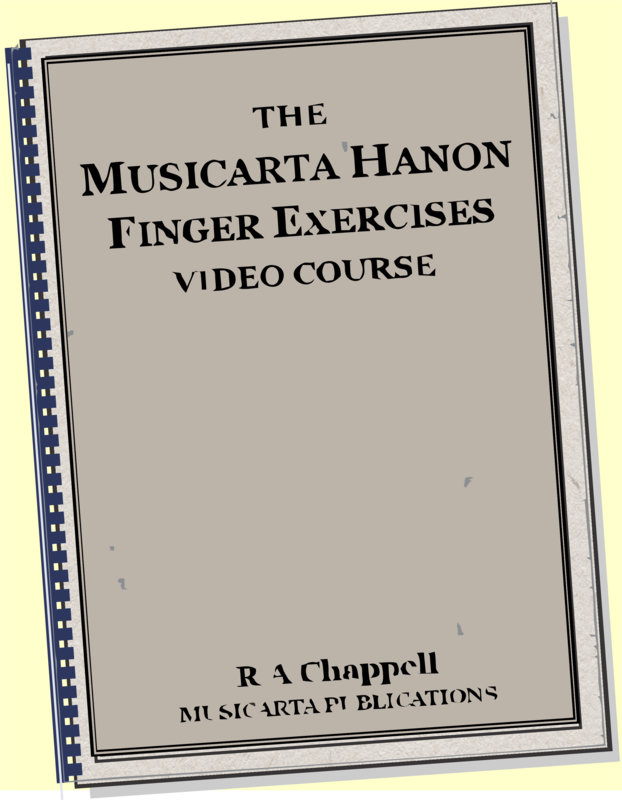 You can watch some general Musicarta inversions material on Mister Musicarta YouTube. The circles-and-triangles inversions illustration comes from the Musicarta Keyboard Chord Generator. Download it free! 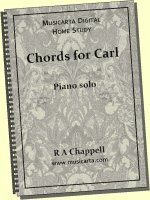 Now go on to the Pyramids Variations Sample Lesson Four to see how you can be following a chord chart and playing from the bottom of the keyboard to the top, developing a a free-flowing chord technique you can use in all your playing.